Picture-postcard beaches, succulent seafood, great shopping, vibrant nightlife, turtles and thrilling water sports – it’s no wonder Barbados is such a popular beach holiday destination. The south coast is certainly the liveliest area of this beautiful Caribbean island, offering everything you need for the perfect getaway – sun, sea, surf… and nightlife. There’s so much to see and do here, but where do you begin? From flying fish - the island’s national dish, to where to soak up a bit of culture and where to find the best beaches to lounge on, we’ve got all you need to know for your first trip to this coastal paradise. The weather in Barbados is truly tropical, with lots of sun, a bit of rain, and a regular warm temperature of around 26 – 30 degrees. From December to April the island experiences its dry season, which is certainly a favourite with tourists thanks to its beaming sunshine, whilst the wet season from May to November does see some rain and humidity. 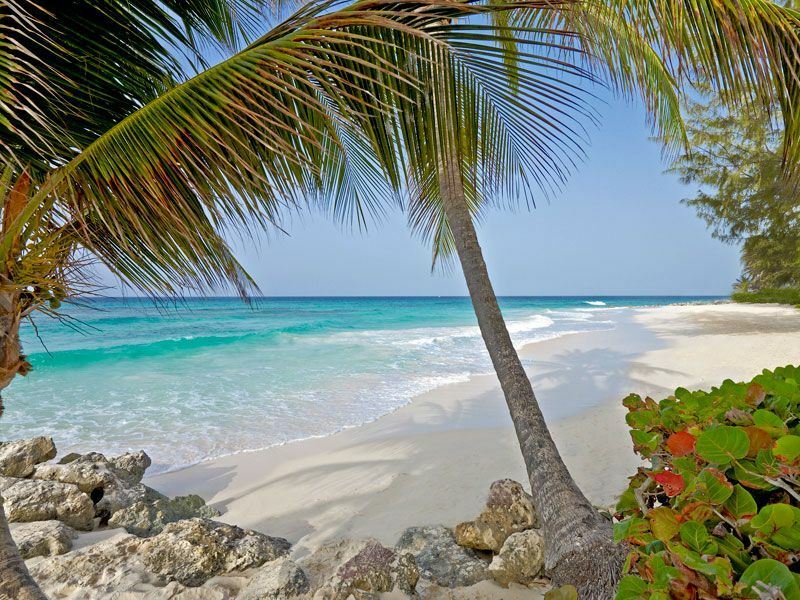 There is a wide range of beaches to sink your toes in to in Barbados’ south coast. 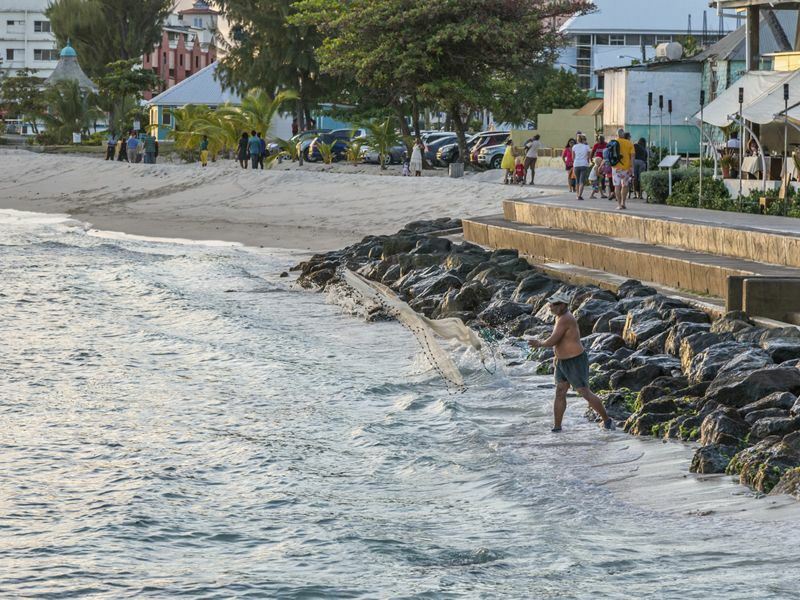 Nestled in the middle of St Lawrence Gap is Dover Beach, a laid-back shore that’s great for families. The water here is nice and calm, perfect for a lazy swim in between soaking up the sun’s rays. For those looking for something a little more active, you’ll find jet skiing, boogie boarding and even windsurfing taking place along this stretch of beach. If you’re hungry after all that excitement, there are several stalls providing cooled drinks, sweet ice creams and plenty of snacks. Families will love Accra Beach too, one of the most popular beaches in Barbados. Parents can sit back and relax in the sun as the kids splash around in the pool-like area surrounded by rocks, sheltering them from any wild waves in the ocean, whilst older children will love the thrill of riding the waves on a colourful mini sailing catamaran called a Hobie Cat. When the sun starts to set, make sure to meander through the vibrant kiosks nestled near the boardwalk, offering local hand-made jewellery and clothing. A myriad of delicious aromas from the food stalls will be sure to lure you in; Tiki Bar is a great spot for a quick lunch, whilst Quayside Centre has a wide variety of sumptuous international cuisine to choose from. If you’re hoping for a romantic moment on the beach, St Lawrence Bay offers the perfect landscape and ambience. The sunsets here are beautiful, and at low tide you’ll be able to stroll a long way out on to the pristine white sand, whilst taking in unique rock formations and looking out for gorgeous sea turtles. There are plenty of gourmet restaurants nestled here too, to add to the romance. You’ll never be bored during a holiday to Barbados thanks to its abundance of exhilarating water sports. The Caribbean Sea is lively near the island’s south coast, with the small crashing waves providing the perfect landscape for fun, fast sports including jet skiing, parasailing and boogie boarding. Fancy something a bit calmer? Stroll along to Dover Beach where the sea is more peaceful and slowly kayak along the sparkling shore. Swimming with turtles is an excursion you won’t want to miss when visiting Barbados. Hop on a catamaran and whizz along the topaz waters, before popping on your snorkelling equipment and exploring the wonders of the Caribbean sea. Magnificent turtles will playfully swim around you, alongside schools of bright, tropical fish and striking coral, whilst some catamaran cruises also take you to incredible ship wrecks to snorkel around the rusted remains. Most tours even provide a tasty lunch and a glass of fruity rum punch, so you’ll be sure to have a fabulous day out amongst the island’s abundance of marine life. It’s not just about beach activities here though. If you’re hoping for a bit of culture in between sunbathing and sipping ice-cold cocktails, Barbados is host to a variety of galleries and museums that will both fascinate and entertain. On The Wall Gallery and Frangipani Art Gallery hold striking pieces created by locals and other Caribbean artists, whilst Barbados Museum & Historical Society will immerse you in the island’s rich and interesting history. With gentle, rolling hills, incredible bright green landscapes and the glistening ocean as your backdrop, it’s no wonder the beautiful Barbados Golf Club is a hit with golf enthusiasts. Get your tee shot ready on this fantastic 18-hole championship course, offering a fun game for any ability and a welcoming atmosphere. No trip to Barbados is complete without trying the national dish – a delectable plate of flying fish and cou cou. The flying fish is meaty, and deliciously stewed in gravy seasoned with herbs, tomatoes, garlic and butter, whilst the cou cou is a simple blend of cornflour and a small, vibrant vegetable called okra. Usually served on a Friday, this meal is favoured by the locals, but there are plenty of other variations too. At lunchtime, wander up to a food truck and order a flying fish cutter, usually coated in a crispy batter and served as a sandwich. 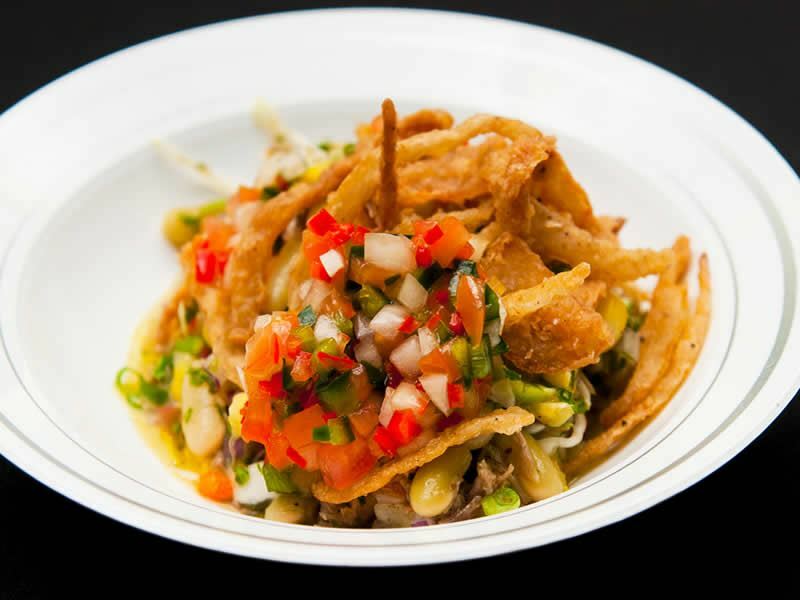 Fancy even more Bajan cuisine? Macaroni pie is a truly sumptuous treat, or head to the Mr Delicious food truck on Miami Beach for some of the best fish cakes on the island. Bajan food itself is a wonderful assortment of African, European, Indian, Chinese and Caribbean influences, providing an exotic flavour for your taste buds. You’ll be able to try it all thanks to the inexpensive restaurants on offer, too – what could be better? Further reading: Discover a true taste of Barbados with our flying fish recipe. If you’re an avid foodie you won’t want to miss Fish Fry, held every Friday at Oistins Garden Bay. Feel the beat of the calypso rhythms as you saunter to the beachside BBQ and party, laden with incredible dishes and excitable locals dancing the night away. A plate of fish and a bottle of beer will cost around £10-15, but it’s all worth it for a plate piled high with barbequed swordfish, flying fish, mahi-mahi and tuna. Once happily full of food, there are plenty of arts and crafts stalls to wander through too. Food is usually served from 7pm, but get there early for a stunning sunset and to see the turtles. Don’t forget to wash it all down with a drink. The south coast of Barbados is widely known as a party island - and with so many incredible rum-based cocktails on offer, there’s no question why. Along the coast you’ll be met with a wide variety of vibrant reggae and soca clubs with extensive cocktail menus, all adding a bit of fruity Caribbean flavour to your evening. Be sure to get a taste of Mount Gay Rum – originating from Barbados, this alcoholic beverage is sweet, smooth and adds a certain pizzazz to any cocktail. Get into the party spirit at St Lawrence Gap – a 1.3km stretch full of lively attractions and a whole host of fun. Walk along the street and you’ll be met with chilled reggae music blasting from The Cove’s speakers, the smell of Caribbean spices wafting from Sharkey’s, and soaring palm trees swaying in the light evening breeze. This street is best known for its fantastic shops during the day, and dynamic nightclubs and bars all throughout the night. With the beach only a few steps away from the Gap’s colourful grasp, this quirky lane will certainly be one you won’t forget. 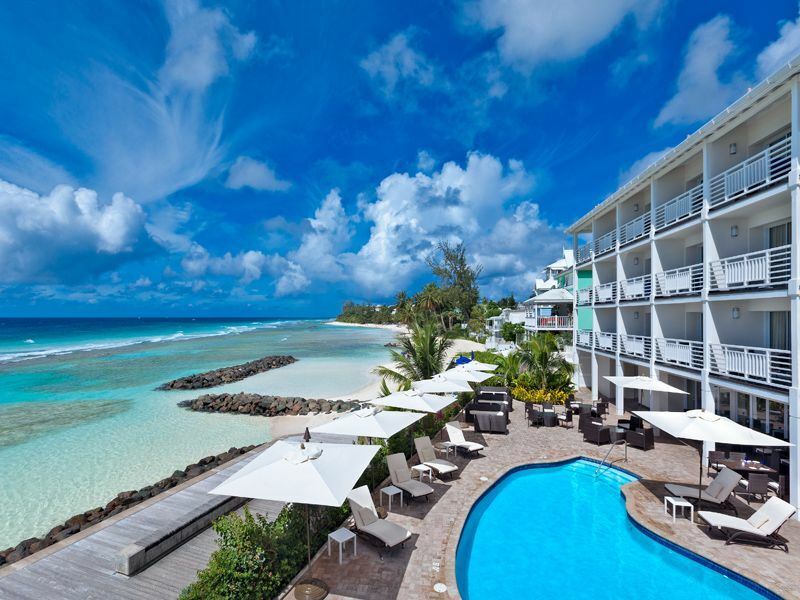 Of course whilst you’re enjoying the stunning beaches, fun activities and delicious food Barbados has to offer, you’ll need a fantastic place to stay. 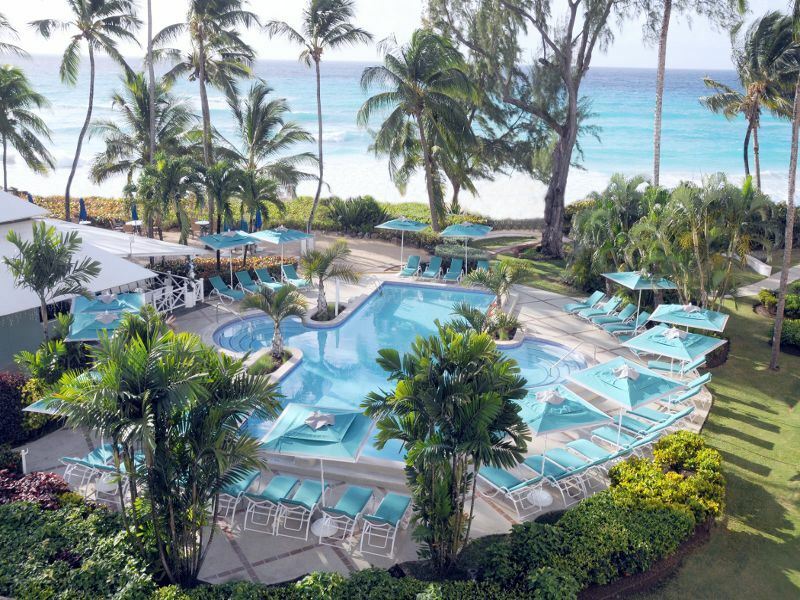 Don’t worry, you’re in luck – the south coast of Barbados is host to a myriad of all-inclusive, luxurious hotels there to cater for your every need. For an air of sophistication, check in to The SoCo Hotel, a stylish all-inclusive retreat nestled right on Hastings Beach. With Accra Beach and St Lawrence Gap only a short walk away, you’ll be graced with a tranquil ambience, yet be close-by to Barbados’ lively attractions. The pool deck oozes glamour, and what could be better than lounging with a rum cocktail in your hand and the Caribbean Sea just in view? If you fancy a stylish family beach holiday, make your way to Turtle Beach by Elegant Hotels. This all-suite, all-inclusive hotel is just down the road from the bustling St Lawrence Gap on Dover Beach, with bright, tropical décor and a beautiful beachfront pool. The Flying Fish Kid’s Club is a hub of fun for younger guests, with awesome activities including beach cricket, movie nights, and themed parties – the kids won’t want to leave. 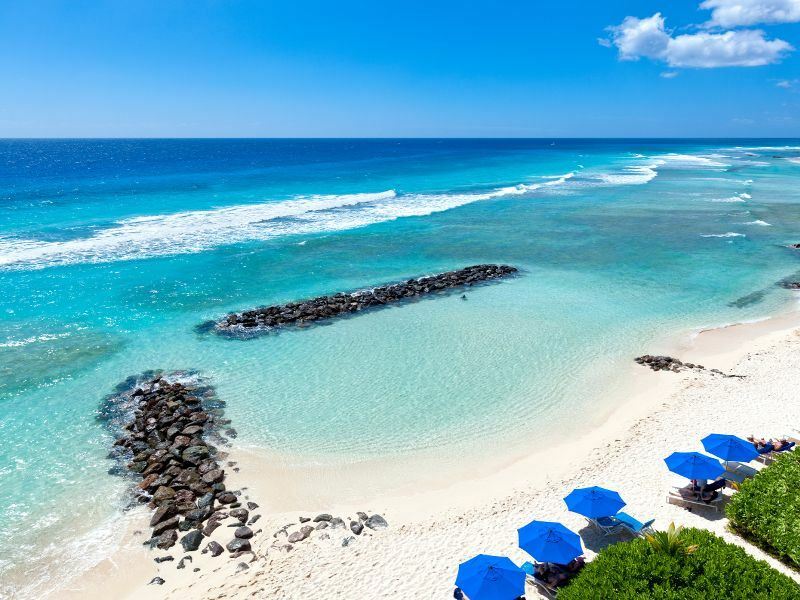 Perfect for couples, families, and groups looking for a fun time, the south coast of Barbados is a tropical oasis with something for everyone.